Author(s): Rimplejeet Kaur, Department of Pharmacology, AIIMS, Jodhpur, Rajasthan, India. Sneha R. Ambwani, Surjit Singh. Cannabis sativa is also popularly known as marijuana. It has been cultivated and used by man for recreational and medicinal purposes since many centuries. Study of cannabinoids was at bay for very long time and its therapeutic value could not be adequately harnessed due to its legal status as proscribed drug in most of the countries. The research of drugs acting on endocannabinoid system has seen many ups and downs in the recent past. Presently, it is known that endocannabinoids has role in pathology of many disorders and they also serve “protective role” in many medical conditions. Several diseases like emesis, pain, inflammation, multiple sclerosis, anorexia, epilepsy, glaucoma, schizophrenia, cardiovascular disorders, cancer, obesity, metabolic syndrome related diseases, Parkinson’s disease, Huntington’s disease, Alzheimer’s disease and Tourette’s syndrome could possibly be treated by drugs modulating endocannabinoid system. Presently, cannabinoid receptor agonists like nabilone and dronabinol are used for reducing the chemotherapy induced vomiting. Sativex (cannabidiol and THC combination) is approved in the UK, Spain and New Zealand to treat spasticity due to multiple sclerosis. In US it is under investigation for cancer pain, another drug Epidiolex (cannabidiol) is also under investigation in US for childhood seizures. Rimonabant, CB1 receptor antagonist appeared as a promising anti-obesity drug during clinical trials but it also exhibited remarkable psychiatric side effect profile. Due to which the US Food and Drug Administration did not approve Rimonabant in US. It sale was also suspended across the EU in 2008. Recent discontinuation of clinical trial related to FAAH inhibitor due to occurrence of serious adverse events in the participating subjects could be discouraging for the research fraternity. Despite some mishaps in clinical trials related to drugs acting on endocannabinoid system, still lot of research is being carried out to explore and establish the therapeutic targets for both cannabinoid receptor agonists and antagonists. One challenge is to develop drugs that target only cannabinoid receptors in a particular tissue and another is to invent drugs that act selectively on cannabinoid receptors located outside the blood brain barrier. Besides this, development of the suitable dosage forms with maximum efficacy and minimum adverse effects is also warranted. Another angle to be introspected for therapeutic abilities of this group of drugs is non-CB1 and non-CB2 receptor targets for cannabinoids. In order to successfully exploit the therapeutic potential of endocannabinoid system, it is imperative to further characterize the endocannabinoid system in terms of identification of the exact cellular location of cannabinoid receptors and their role as “protective” and “disease inducing substance”, time-dependent changes in the expression of cannabinoid receptors. 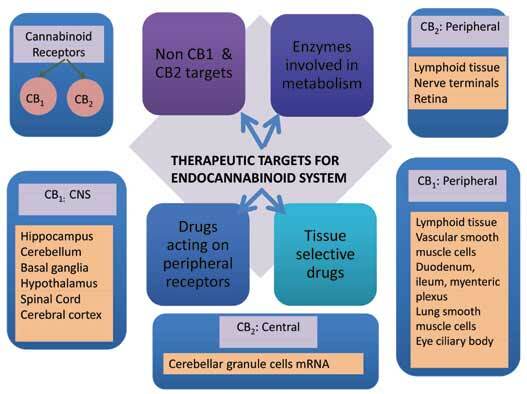 Keywords: Endocannabinoids, CB1 and CB2 receptors, endocannabinoid targets. Affiliation:Department of Pharmacology, AIIMS, Jodhpur, Rajasthan, India. Keywords:Endocannabinoids, CB1 and CB2 receptors, endocannabinoid targets. Abstract:Cannabis sativa is also popularly known as marijuana. It has been cultivated and used by man for recreational and medicinal purposes since many centuries. Study of cannabinoids was at bay for very long time and its therapeutic value could not be adequately harnessed due to its legal status as proscribed drug in most of the countries.